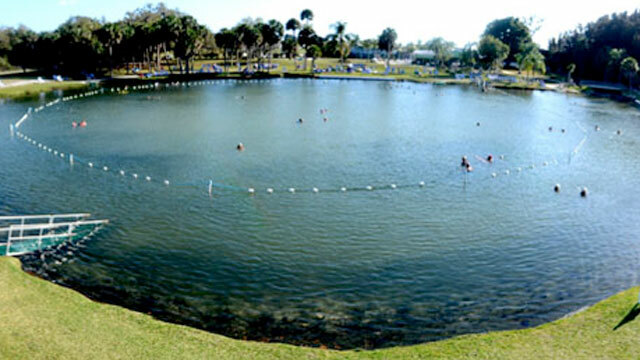 Warm Mineral Springs is located on US-41 (the Tamiami Trail) in North Port about 12 miles southeast of Venice. It's an old Florida tourist attraction that often gets overlooked by modern visitors dazzled by the glamour and activity of the larger theme parks. Still, 65,000 visitors - many from Europe - come to soak in the mineral waters every year. Most of them would like to keep this great little place a secret. The geology is that of a solution hole that goes deep into a Florida aquifer. Water comes up from the depths at 97 degrees F. This water is mixed with cooler water from various vents and stabilizes the year around temperature near the surface at 85 degrees F.
This natural spring is replenished daily by 9 million gallons of water. The spring waters are claimed to contain 51 different minerals, the highest mineral content of any spring in the United States. Many repeat visitors claim these waters restore their health and make them feel better. They claim relief for everything from arthritis to the heartbreak of psoriasis. There is plenty of room to swim in the spring or just relax and soak. 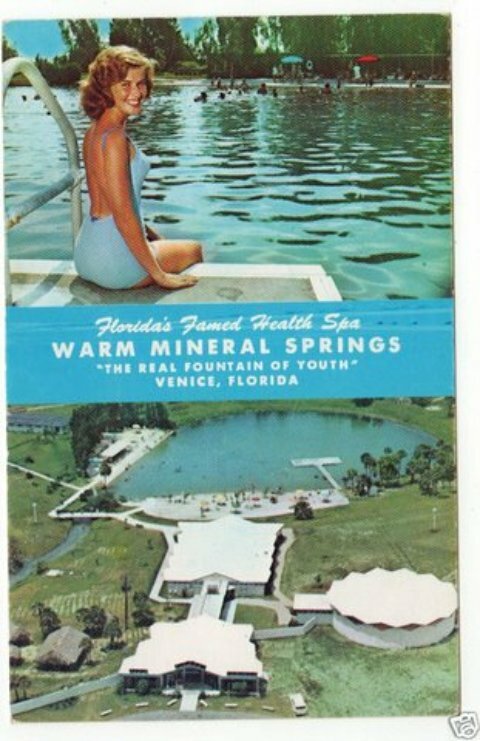 Warm Mineral Springs: Fountain of Youth? Many people claim that this spring is really the Fountain of Youth that Juan Ponce de Leon was searching for when he first landed in Florida. On his last trip he was still searching for the mythical fountain when he and 200 of his people landed on Charlotte Harbor south modern day North Port and Venice in 1521. Not long after they landed they were attacked by local Indians. Ponce was badly wounded and his ships took him back to Cuba where he died in July of 1521. He did not live long enough to try the restorative waters of this spring. Maybe he could have survived and still be alive today to tell us about his miracle Fountain of Youth. Check the Warm Mineral Springs website for hours of operation and current admission charges.